Acting Prime Minister Semisi Sika issued the nationwide alert, saying he was "satisfied that an emergency is happening or is about to happen in the kingdom". Cyclones are common in the Pacific at this time of year. Nuku'alofa: Tonga declared a state of emergency Monday as a powerful cyclone bears down on the Pacific island nation after wreaking havoc in neighbouring Samoa. Severe Tropical Cyclone Gita is intensifying as it approaches and the Fiji Meteorological Service predicted it will become a maximum category five storm before reaching Tonga on Monday night. It is already packing wind gusts of 220 kmh (137 mph) as it gathers strength some 370 kilometres east of Tonga's most populous island Tongatapu. Tonga's Fua'amotu Weather Forecasting Centre warned residents could expect "very destructive hurricane force winds". 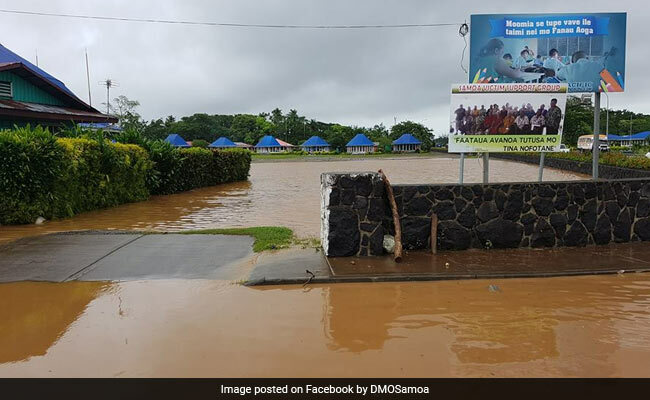 Gita slammed into Samoa overnight Friday, forcing the evacuation of some 200 people and causing widespread flooding, leaving many without power and electricity. Tonga's information ministry said evacuation centres were being prepared across the kingdom and advised residents to avoid unnecessary travel. "Every family should have an emergency kit packed in their homes," it said. "Everyone should be mindful of what might cause damage within their homes such as large trees that can potentially damage a house." Cyclones are common in the Pacific at this time of year, with top-of-the-scale category five systems proving highly destructive when they make landfall. Cyclone Winston killed 44 people in Fiji in 2016 and Cyclone Pam claimed 11 lives and damaged 65,000 homes in Vanuatu in 2015.